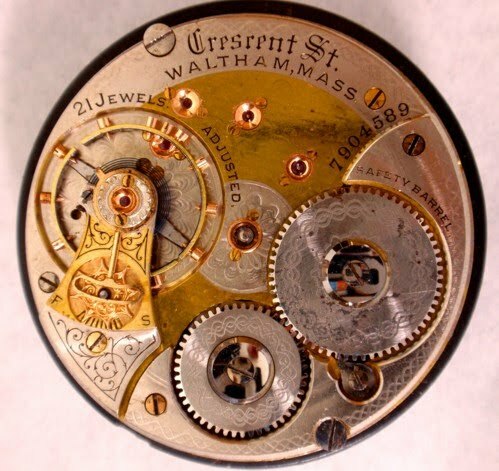 For a short time Waltham makes the 21 Jewel Crescent Street in a two-tone movement. The first two tables below show the runs of open face and hunting case movements. 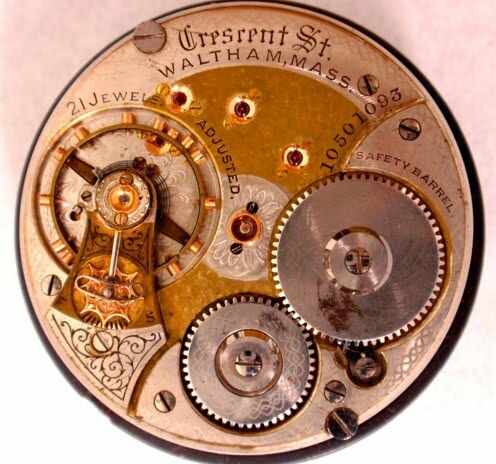 Waltham does not cease making the all nickel Crescent Street during the period that the two tone movement is being made which might suggest that they were made for a special purpose, but who knows? They were made over a long enough period of time that they fall into different movement variations. The table breaks down the number produced by variation. The Gray Book lists the 782001-7821000 run (open face) and the 7819001-782000 run (hunting case) as being 17-21 Jewel Crescent Streets. The 17 Jewel Royal, also a two-tone movement and 17 Jewel two-tone Crescent Streets have also been reported from these two runs. The 17 Jewel Crescent Street is actually an interesting adaptation made from the Royal movement and it is covered in a seperate section. In order to determine the Number in Run (NIR) for the 21 Jewel Crescent Street, a bit of guess work has been necessary. The third table below shows each of these runs and actual serial numbers that have been reported so you can make your own assessment as to production figures. The serial number position (SNP) and number of barrel bridge screws are the features which determine the differences in variation. 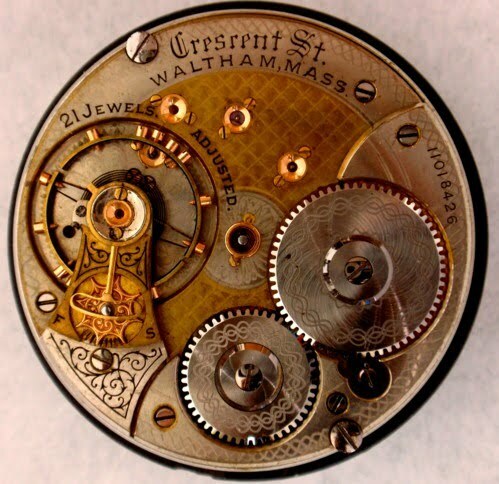 It is interesting to note that all variations of the open face 21 Jewel two-tone movement use the round hairspring stud, even those made after 10517801, when Waltham begins using the Patented Stud. The last run of two-tone hunters uses the Patented Stud. from run 782001-7821000 O.F. from run 7819001-7820000 Htg.